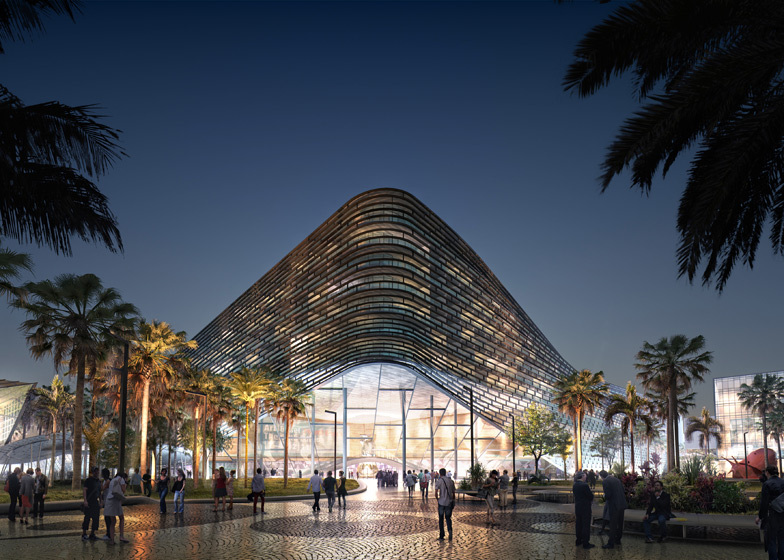 A large public square is at the heart of Danish firm BIG's proposed overhaul of Miami Beach Convention Center, home to the annual Art Basel/Miami and Design Miami trade fairs (+ slideshow + movie). 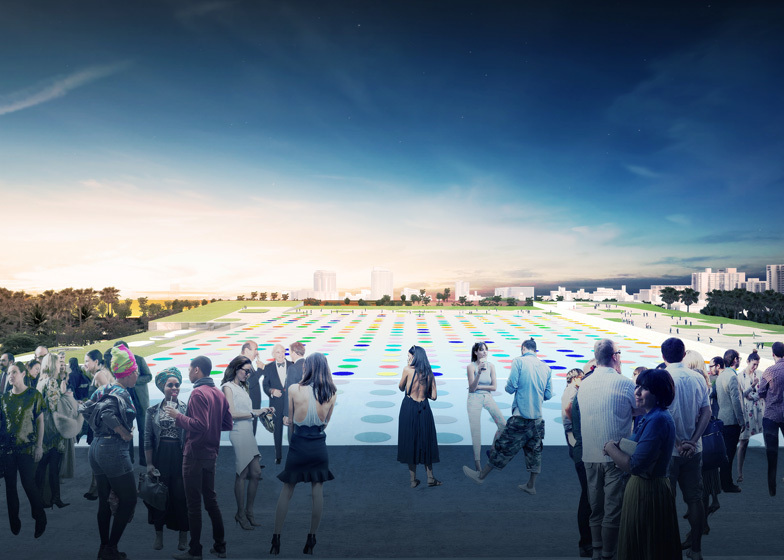 Bjarke Ingels' firm will present its proposal to the Miami Beach City Commission today, where it will go head-to-head with a rival design by Dutch firm OMA. BIG produced its proposal in a team called Portman CMC, which includes property developers Portman Holdings and CMC Group, architects John Portman & Associates, West8 and Fentress Architects, and circus entertainers Cirque du Soleil, who would provide an event space on the site. 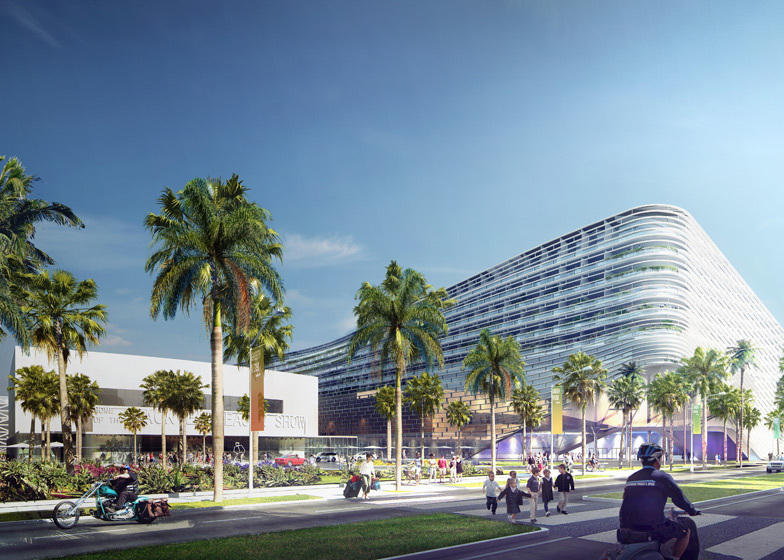 Miami Beach Convention Center is currently "a dead black hole of asphalt in the heart of one the most beautiful and lively cities in America," the team explain. "Our mission is to bring Miami Beach back to the Convention Center." 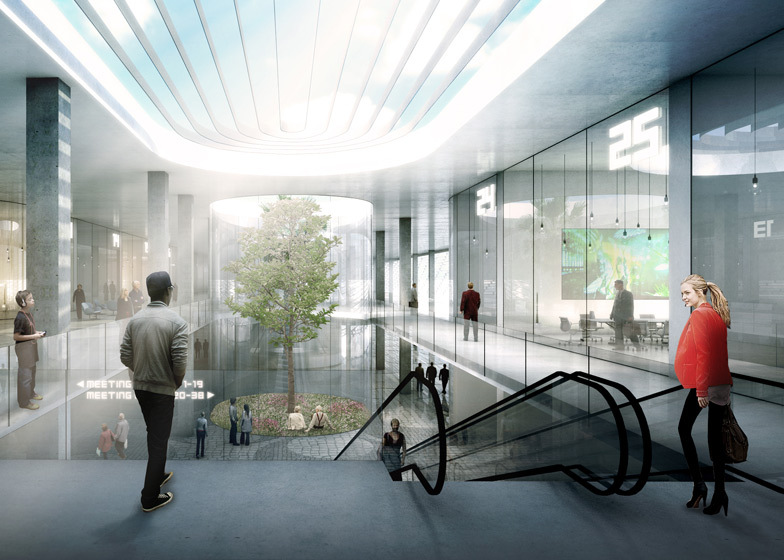 The proposal is centred around the creation of a public square, with paths, plazas, gardens and parks connecting the convention centre with the surrounding buildings. 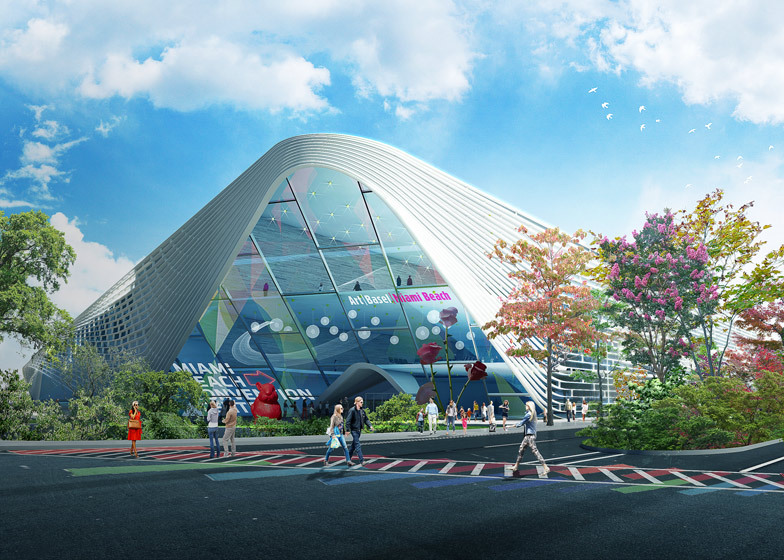 The convention centre itself would be given a green roof, which would function as an event space and a location for annually commissioned artwork. The Jackie Gleason Theater would be renovated and its street level lobbies, restaurants and cafe made publicly accessible, while a new museum for Latin American culture would be built alongside it. The proposal also includes a hotel and several blocks of apartments. 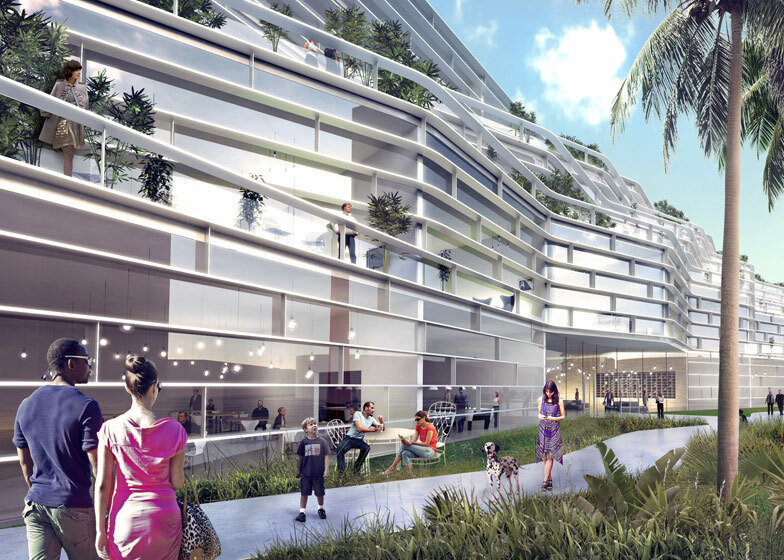 Both BIG and rival team OMA are also on the shortlist to design a centre for the Nobel Prize in Stockholm, Sweden, while earlier this year BIG unveiled plans for two twisted apartment blocks in Coconut Grove, Miami – see all architecture by BIG. Other Miami projects we've featured lately include architect John Pawson's 26 luxury apartments for Miami Beach and a multi-storey car park by Herzog & de Meuron that hosts parties, yoga classes and weddings – see all projects in Miami. 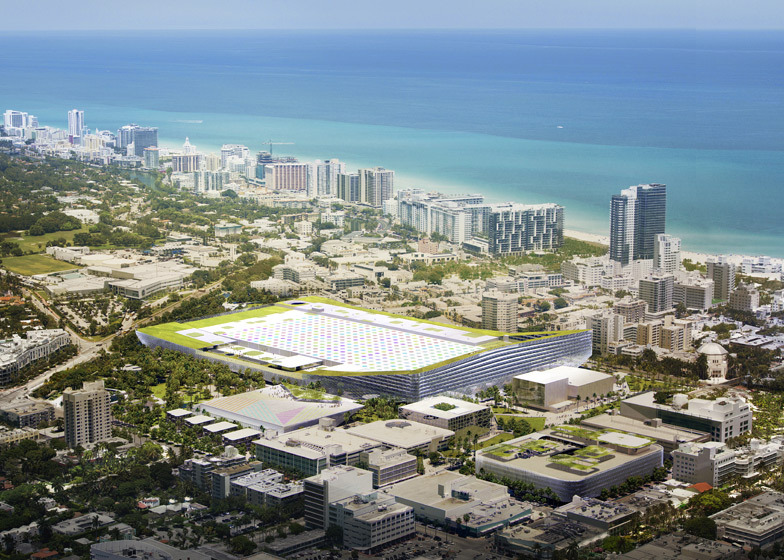 BIG together with West 8, Fentress, JPA and developers Portman CMC proposes Miami Beach Square as the centerpiece of their 52 acre Convention Center. Miami Beach is a unique city in so many ways. It is one of the youngest cities in America – and perhaps right now one of the most vibrant and dynamic. Its streetscape is characterised by a lively walkable urban fabric with a friendly human scaled environment under the cool shade of tropical trees and art deco canopies - except at the convention center. It is a dead black hole of asphalt in the heart of one the most beautiful and lively cities in America. 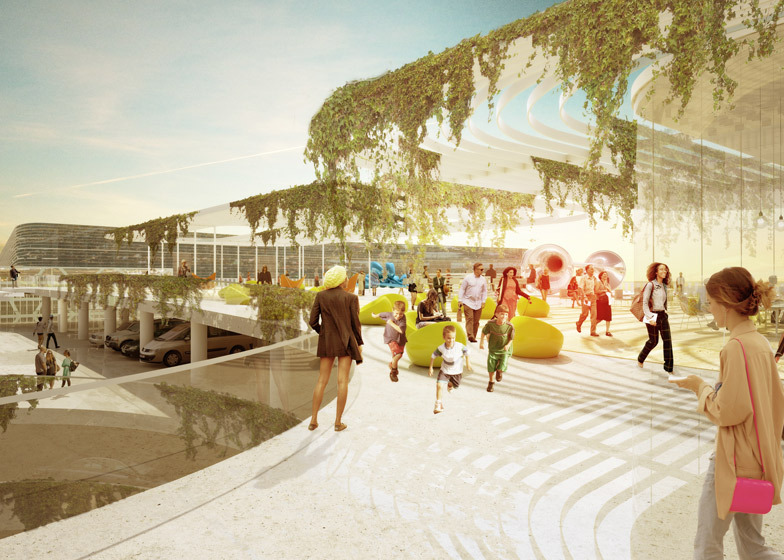 Our mission is to bring Miami Beach back to the Convention Center – and to imagine an architecture and an urban space unique to the climate and culture of Miami Beach. We propose to roll out an urban fabric of paths and plazas, parks and gardens that forms an archipelago of urban oases throughout the site. At the heart of it we introduce a central square to become the pivoting point of the entire neighbourhood, becoming the front door to the convention centre and the convention hotel, a front lawn to the revitalised Jackie Gleason Theater, a town square for the city hall, an outdoor arena for the Latin American Cultural Museum, and the red carpet for the big botanical ball room. The square creates a series of intuitive connections across the site – a diagonal that connects the Soundscape to the Botanical Gardens and Holocaust Memorial. A north-south connection joins the Collins Canal to Lincoln Road and naturally channels the flow of convention visitors to the liveliness of Lincoln Road. A green network of public spaces that stitches together all of the adjacent neighbourhoods – formerly separated by the convention centre – into a complete and coherent community for both visitors and residents. All public programmes old and new come together on the square. 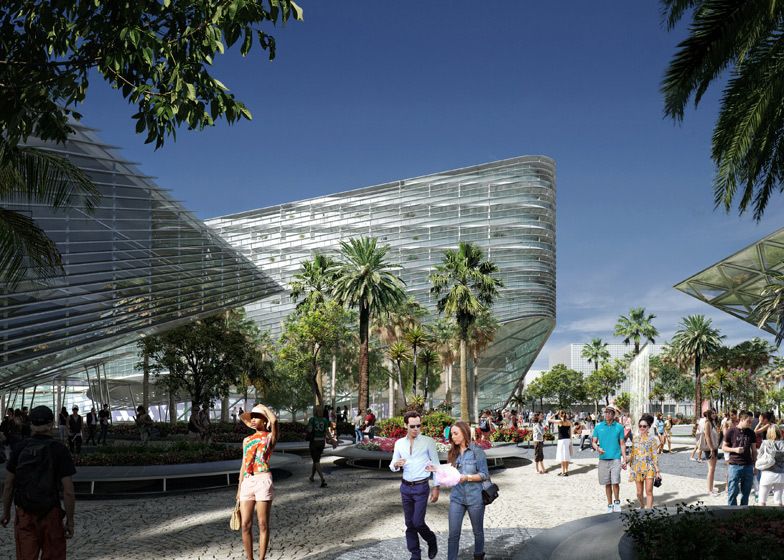 All great cities have a great square – this will be Miami Beach Square. By popular demand we have found a way to preserve and enhance the architecture and programming of the Jackie Gleason Theater. By making it all public at the street level – opening up lobbies, restaurants and cafes on all sides – we make the Gleason a lively centerpiece in this new neighborhood. Towards the Square we propose to extend the fly tower with a performing arts centre with various spaces for rehearsal and offering a visual connection to the public. Adjacent to the Jackie Gleason Theater sits the new Latin American Cultural Museum consisting of a base of public programmes opening up on the square. 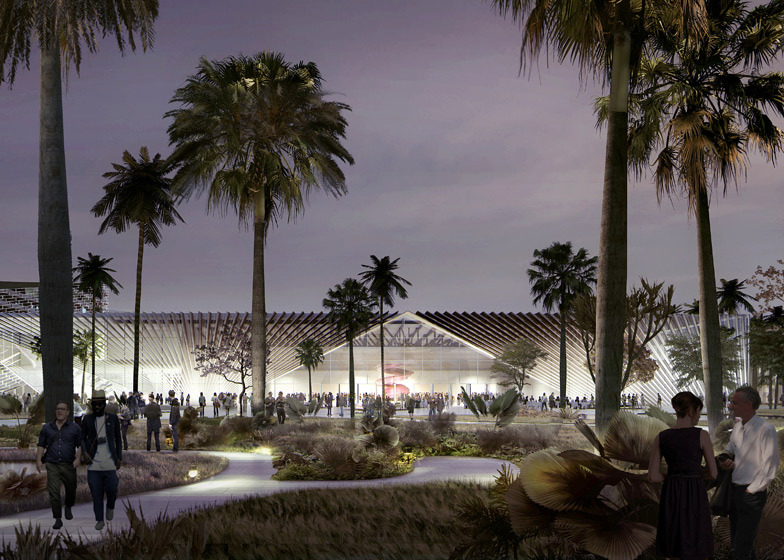 The building form creates a covered shaded event space on the square blurring the transition between inside and outside. Today the Miami Beach City Hall is almost like a leftover wedged between random neighbours surrounded by traffic. Our proposal places it right in the middle of the town square with ample space for public expression and at the heart of communal life. 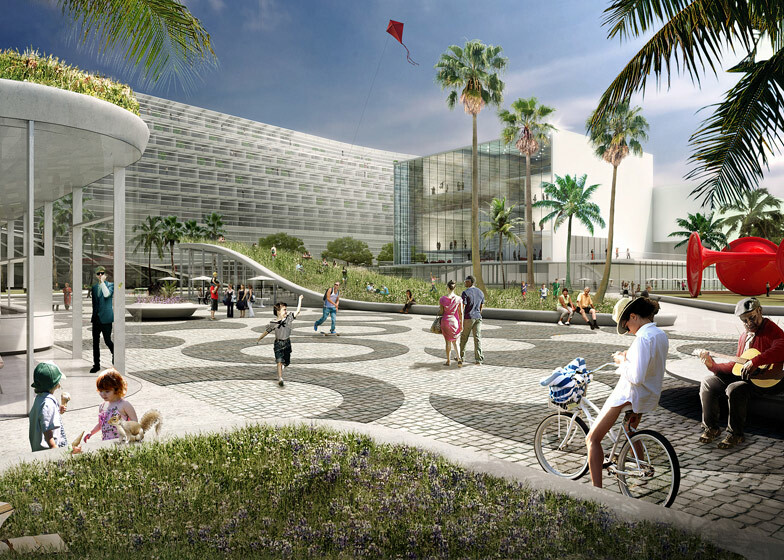 The Miami Beach City Hall and Botanical Ballroom bookend the Square making it a natural extension of the civic activities of city hall. To the north the botanical ballroom opens up allowing for beautiful views of the botanical gardens and the memorial. The Ballroom has an entrance to the south and to the north allowing for seamless connectivity to the convention centre – under the shade and shelter of the canopies. 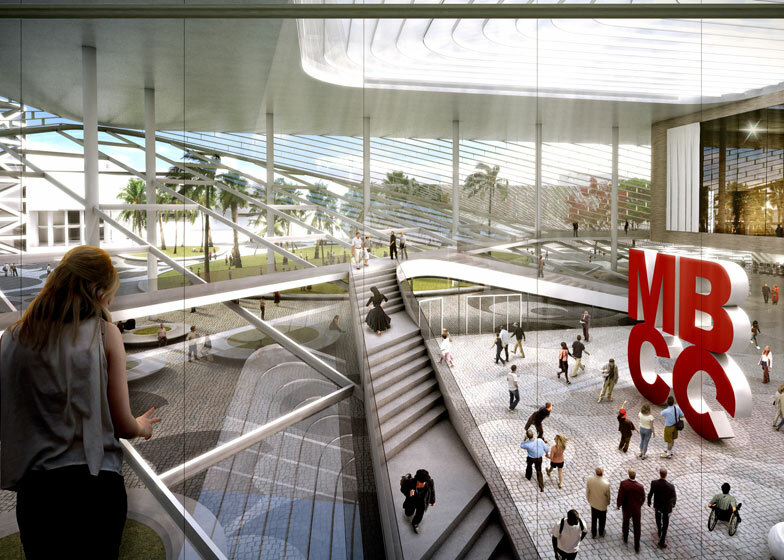 Rather than being the hermetic monoprogrammatic box that the Miami Beach Convention Center is today – a single programme at the size of an urban block - we propose to consider the Convention Center an actual urban block complete with different programmes, grown together to form a continuous architecture. A gradual transition from public to private, cultural to civic, conference to residential turns a stroll around the block into an experience of continuous variation. Along the entire west adjacent to the various gardens and the new square - the main entrances to the Convention Center and Conference Center occupy the ground. The hotel lobby spans the entire south elevation in continuation of the Convention Center lobby. The hotel façade as pulled back, forming a cascade of terraces for the south facing hotel rooms – decreasing the perceived height seen from the Gleason. 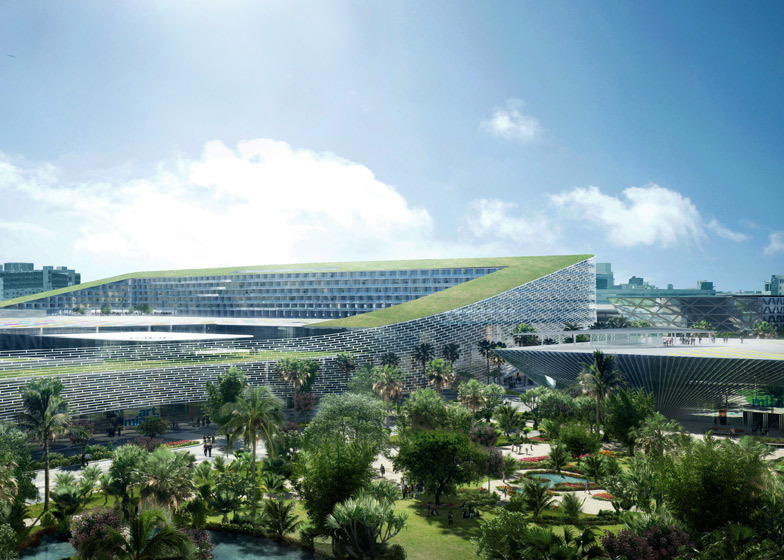 The roof of the Convention Center is framed by a green roof drawing the outline of the urban block – framing the hotel gardens and the roof parking interspersed with shade giving landscapes. As a reoccurring annual event we propose to sponsor an art foundation that will deliver a roof art piece to cover the remaining roof surface turning it into a giant ever-changing canvas seen from the air as well as the roof terrace of the hotel. An ever changing giant canvas that will annually challenge contemporary artists with an architectural scale canvas – seen from the roofs and penthouses of adjacent buildings, from aeroplanes and Google Earth.